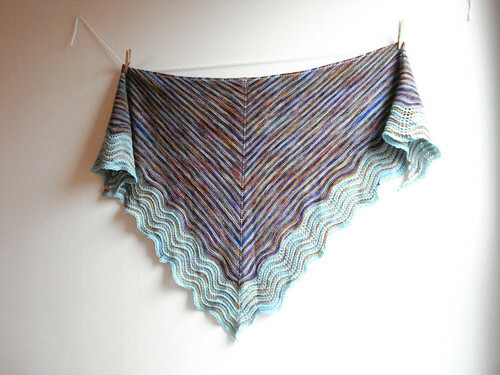 Thea Eschliman Designs: Hera Mountain Ridge Shawl Pattern! Hera Mountain Ridge Shawl Pattern! Months ago after knitting up the Hera Mountain Ridge Shawl for the BSG Fleet Power Battle on Ravelry, which I have been sadly neglecting this new year, I thought what the heck I will just whip up the pattern since it was so easy to make! The concept is super easy, writing out step by step instructions was a whole other matter. I just don't think that way. I can trace this problem back to Junior High where I would fail to write out all my "work" to math problems. Then skip ahead to college and my costume construction class when we were asked what we thought the next step was and I would raise my hand and give the 10th step ahead. Or just look at the blank or confused faces of my friends and coworkers when I have started talking about something seemingly unrelated to our conversation because I failed to communicate what thought process led me to connect the two topics. I tend to assume everyone's brain follows the same problem solving path mine does so I skip stuff in the middle. Then when I try to explain the stuff in the middle it seems overwhelmingly complicated. Anyway, I got a message the other day asking about the pattern and since it was mostly written out, just sitting as an unpublished post in my blogger account, I thought I would dust it off, attempt to edit it and just publish it. So here is the link. I recommend reading it the entire way through before starting to see if you understand what I am describing. There is also a quick paragraph at the end summing up what I had written up if you are more of a big picture, figure out the details on your own kind of knitter like I am. Let me know if you find any errors or any typos.